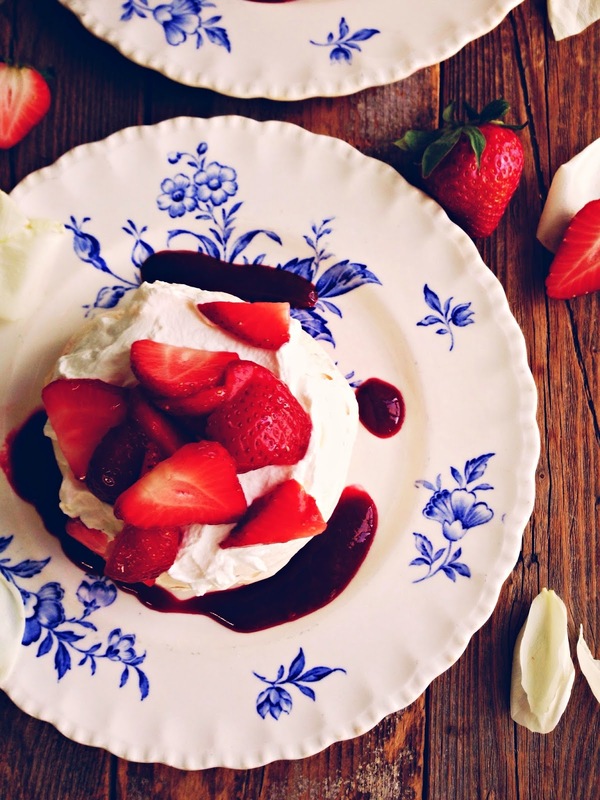 Speaking of contrasts, pavlova is certainly that. The meringue base has a crunchy and crumbly exterior, which just dissolves on your tongue, while the inside is still slightly chewy and toothsome. And sweet. Oh baby the meringue is sweet, which is why you want to dial back the sugar on the rest of the components. I simmered raspberries and pomegranate molasses into a sublime sauce, with just a little maple syrup to sweeten, along with orange juice to heighten the flavour. Unsweetened whipped cream is next. Good lord, is there anything better than whipped cream? Finally, fruit. I would love love love to have used a combination of berries, alas, they are so expensive right now it's like having to sign away your first born child. Alas, I settled for strawberries. Sliced and stirred with a bit of cane sugar to get the juices going, I gently placed these on top of the cream. I stood back and admired my little tower, resisting the urge to take my fork and topple it. Meringues are super fun to make. Egg whites, beaten with a bit of cream of tarter to help hold the shape, and sugar gradually added until stiff peaks form. The meringue gets glossy and shiny, and at this point I beat in a little rosewater. I repeat - a little. This stuff is very concentrated a little goes a long way. Have a light touch so as to not smell like your Grandma's linen closet. Next up, either pipe little nests of meringue or use a 1 cup measure to scoop them out and then just shape with a spoon or your finger. I was making these at 9:00 at night and didn't feel like using a piping bag, so scooping out with a measuring cup was my method of choice. The oven is set to 200*F and they bake for 2 hours. Turn off the heat and let them hang out overnight. That's right. You get to leave things in the oven and go to sleep! Just remember to remove them the next morning before you do any other baking. I have the worst short term memory so I just hung a tea towel on the oven to remind myself. It worked. Disaster averted! 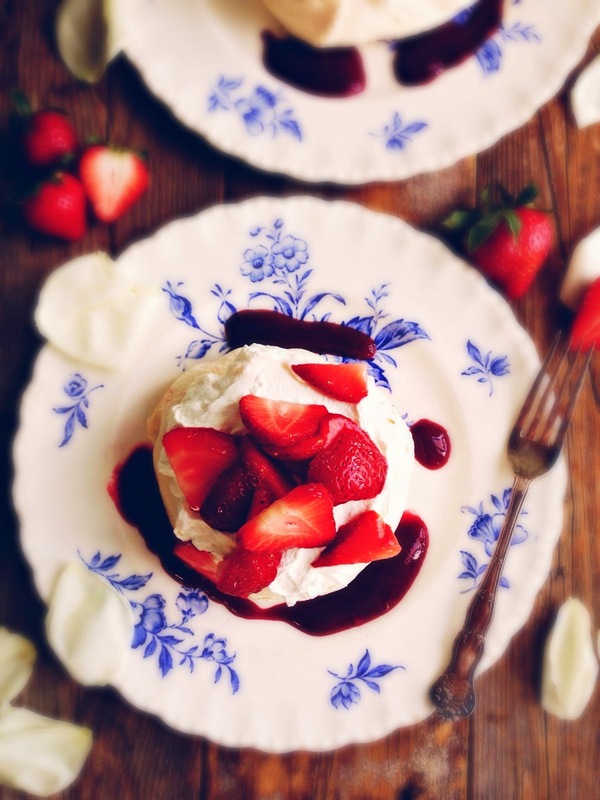 You can make the meringues up to two days ahead of scheduled dessert time. Isn't that great? I like components that can be made ahead. Just store these in a covered container at room temp. I always make a few extra, just because of "quality control". Plating is a breeze. 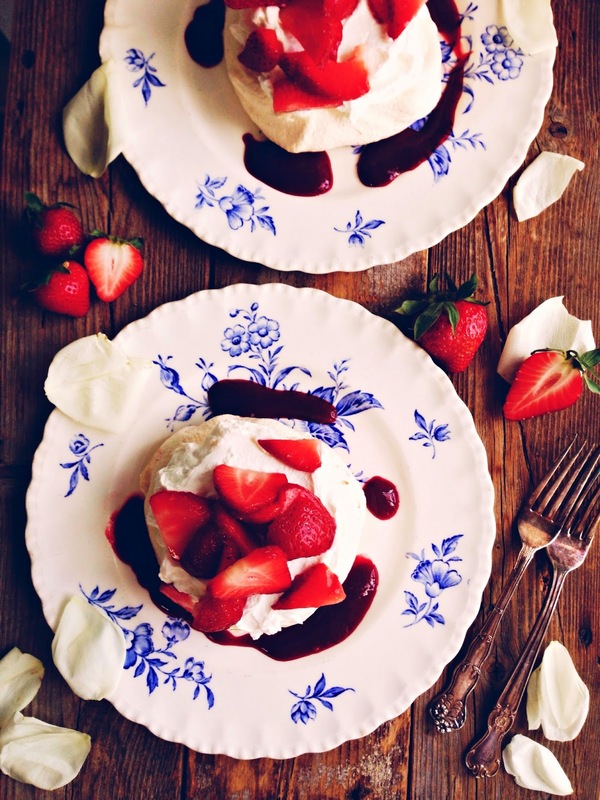 Meringue on plate, sauce the edges of the plate, top with cream then fruit. Voila! It's impressive and pretty. And so much fun to destroy! Food is a necessary and yet impermanent part of life. One minute it's lovely and perfect, the next it's messy and delicious. The layers of textures and flavours play so well here - the tart sauce loves up on the sweet meringue that's just kissed with the right amount of rosewater. 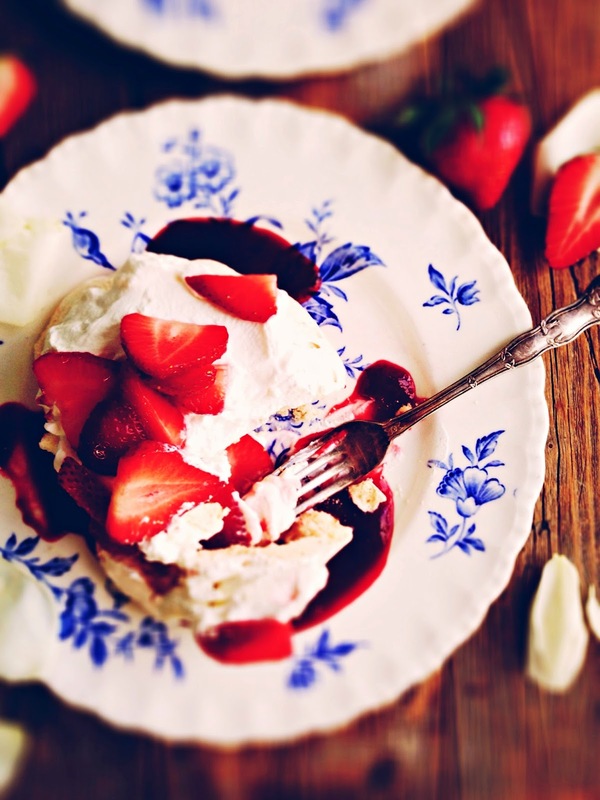 Whipped cream and fresh strawberries, well, we all know how good they taste together. It's a lovely dessert on a spring day when there's so much to celebrate, be it a specific holiday (Happy Easter!) or just you know, life. I have a feeling Olive would have loved it. Rosewater and pomegranate molasses can be found in Middle Eastern grocery stores, or in the ethnic food section of large supermarkets. In Saskatoon, I found both side by side at Superstore. To make meringues: place egg whites and cream of tartar in the bowl of a mixer. Beat on high until soft peaks form. On high speed, gradually add the sugar, 1 tbsp at a time, adding some every 3 seconds until all incorporated. When peaks are thick and glossy, add the rosewater and beat 30 seconds longer. Spoon or pipe out meringues onto a parchment lined baking sheet - I got six large meringues out of this batch, but if you want smaller portions, scoop out or pipe about 8 or 9 into swirly circles. Place in a preheated oven at 200*F and bake for 2 hours. 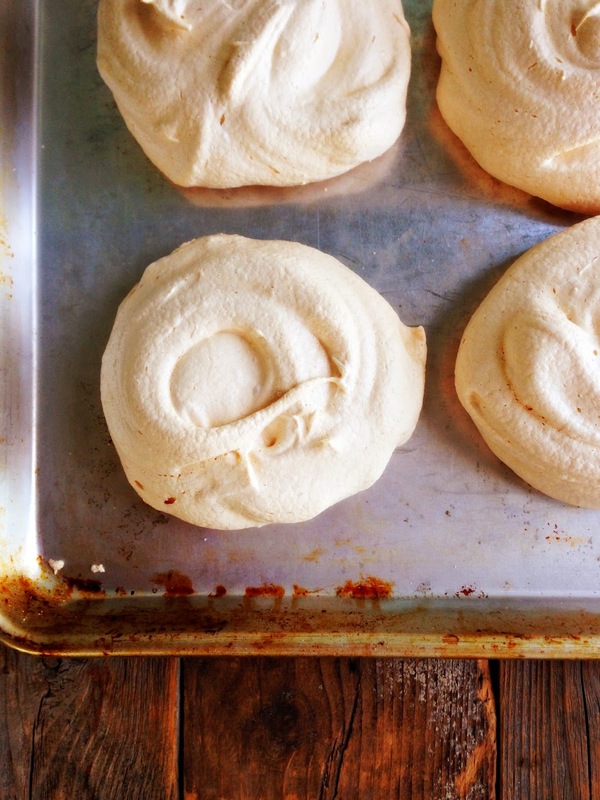 Turn off heat and let meringues sit there for 5-6 hours or overnight. Remove the next morning. Can be made up to 2 days ahead. Store in a covered container at room temperature. Adapted from Local Milk. To make raspberry pomegranate sauce: heat all ingredients except orange juice in a medium saucepan over high heat. Bring to a boil and reduce heat, simmering until berries fall apart, about 5 minutes. Remove from heat and let cool at least 15 minutes. Pour sauce into blender along with orange juice. Blend until smooth, strain through a fine mesh sieve. Add 1 more tbsp of maple syrup if you find it too tart. Makes about 1 cup. Can be stored in the fridge for one week, or frozen for two months. Beat heavy cream until it's fully whipped. Wash and slice strawberries. Toss them with sugar. 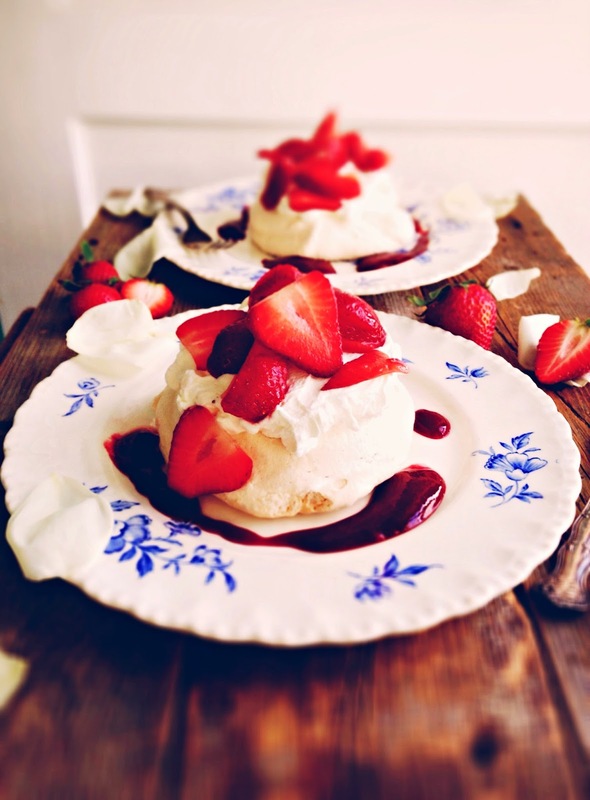 Arrange meringues on plate. Spread sauce on the side of plate. Top with cream then berries. Makes about 6 -8 pavlovas.